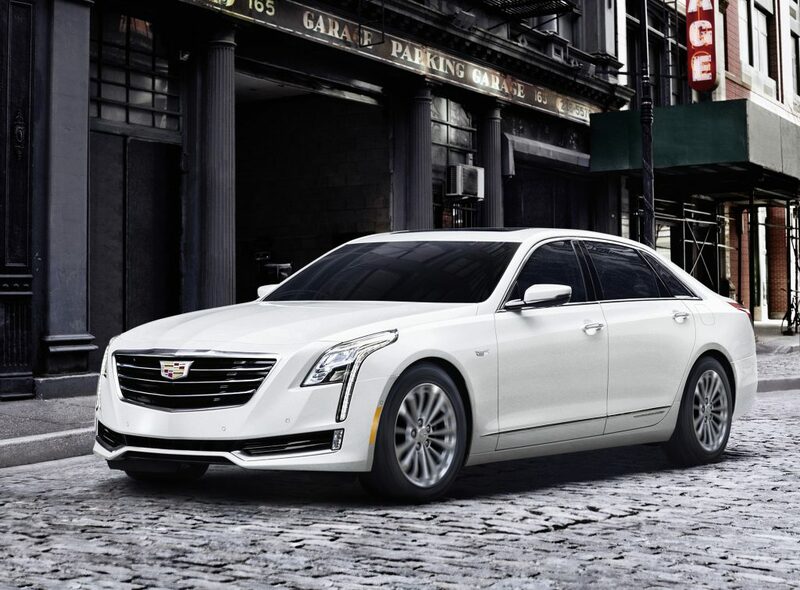 Cadillac’s new CT6 Plug-In Hybrid is built in China? Well, no one should be too surprised, despite the fact that the rest of the CT6 family comes from Detroit. China is a land of major urban pollution, and it leads the planet in its push for electric vehicles. China produced 680,000 electric cars, buses and trucks last year alone — more than the rest of the world combined, according to Forbes magazine. And it plans to sprout 500,000 public charging posts by the end of 2020. So, yeah, no surprise that Cadillac-parent GM wanted in on that mega-market and built a $1.2 billion factory in Shanghai. The CT6 plug-in should do well in a nation where cities are starting to outlaw gas-engine vehicles downtown, and where folks get great incentives to go electric. But the new entry from Caddy may do well here, too, with its boatload of features (it comes only one way, fully loaded), and up to $7,500 in federal tax credits, too. And, of course, it drives like a Cadillac: smooth, strong and steady. It only gets around 31 miles on electric only — on its best day — but there’s a helpful drive mode called “Hold” that will use the gas engine alone to preserve the electric for in-town driving. The electric drive is what boosts this CT6 to an eye-opening 62 mpg-e (equivalent) rating from the EPA. But when you run dry and are driving on gas only, expect no more than 25 mpg combined city/highway. Cadillac calls its powertrain a “blended hybrid.” It starts with a conventional 2.0-liter turbocharged 4-cylinder engine that gets 265 hp. It is mated to a pair of 100-hp electric motors that make up Cadillac’s electric variable transmission, or EVT. Joining the power team is a burly 18.4-kWh lithium-ion battery, wedged between the rear seats and trunk — yes, it steals about 4 cubic feet of trunk space. The battery can be charged in about 11 hours via a typical household 120-volt outlet, and in just 4.5 hours with a 240-volt connection. 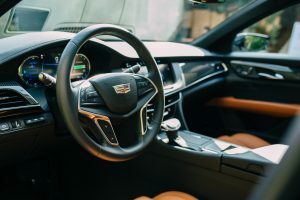 Combining the engine and electric motors, the CT6 Plug-In produces an impressive 335 hp and amazing 432 pound-feet of torque. That’s comparable to Cadillac’s non-turbo V-6. Also comparable is a 0-60 mph time of 5.2 seconds, not bad considering it has to lug around a 400-pound battery within its already husky 4,500-pound frame. On the road, the CT6 has all the power and get-up you’d expect in a rear-wheel-drive luxury car (all-wheel-drive is not an option). It can reach 150 mph with engine and electric motors working together, and it can do 78 mph on electric alone. The ride is smooth, but there is a persistent hiccup whenever the gas engine takes over from electric. Its road manners are exceptional, staying flat on corners and S curves. Bumps and road divots are nicely absorbed, too, especially in Tour mode. The other drive mode, Sport, offers more aggressive acceleration and a (much-needed) boost in steering feel and response. Inside, it’s typical Caddy comfort, luxury and high technology. Hand-stitched, leather-trimmed seats are supportive and come heated, ventilated, and with 16-way adjustment for both driver and front passenger. Cadillac’s CUE information/media system appears on a 10-inch color display and offers navigation, Apple and Android capabilities. There’s a 12-inch digital gauge cluster plus a head-up display for quick data at a glance. And it has a rear mirror-camera — with washer! — that allows unobstructed video views behind instead of the reflective view. A rear-seat, dual infotainment system with wireless headphones allows passengers equal rights to the fun stuff, music and videos. Or, if preferred, a chauffeur can take the wheel while the executive conducts business or enjoys the view through the dual sunroofs. The battery-squeezed trunk has only 11 cubic feet of space but is deep enough for a pair of golf bags. High-tech features extend to the safety package, including an automatic park assist that actually steers and brakes the vehicle. It also has adaptive cruise control with automatic braking, blind-spot alert, lane-keep assist and pedestrian braking. Night vision is improved with an infrared image located between the gauges. So, considering there aren’t too many choices for a luxury hybrid sedan, the CT6 is worth a good look. If maximum mileage is your thing, you might do better elsewhere. But the CT6 Plug-In comes fully loaded, remember, and it’s still easier on the wallet than similarly-equipped options from the European entries. How’s the performance? Smooth cruising with 0-60 mph rated at 5.2 seconds; top speed of 78 mph is possible on electric alone.